45+ new addictive logic puzzle games, from the Lines and other brands to the new best-sellers! 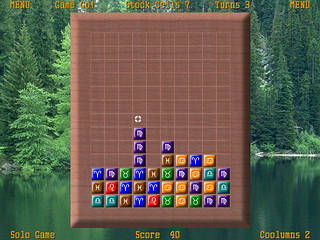 This collection of puzzles includes both the well known games and new hits: Coolumns and Tetra! Full version content: Coolumns Pack, 10 games (1 in DEMO) Lines Pack, 9 games (1 in DEMO) Falls Pack, 7 games Swaps Pack, 5 games Rolls Pack, 5 games (1 in DEMO) Tetra Pack, 10 games (1 in DEMO) Each puzzle includes several levels. Levels differ from each other in terms of their complexity and aroma of the pleasure, reached to player. Full version features: Unlimited games play. Play in 5...10 different games levels. Undo and Redo up to 80 turns of games. Save your games to start where you left off. Customize the background and gameboards design. Amazing full screen graphics. Record your 120 top scores. Coolumns dodger: The new word in logic puzzle game making! A brilliant idea gave a new birth to the remarkable super-hit known as Lines. The game board raised almost VERTICALLY, and the appeal of the game as well as its dramatic nature has increased. The strategy of the game however got much easier, having transformed somewhat difficult Lines into simply fantastically easy, real COOL columns! Besides, Coolumns game levels presents you several various ways to receive new pleasure from the good old Lines!